DRP high-intensity portable infrared construction heaters, part of the DRP PT Series, mount directly onto your LP tank and are ideal for both outdoor and indoor temporary use in construction zones, especially in situations where no permanent electrical power source is yet available. 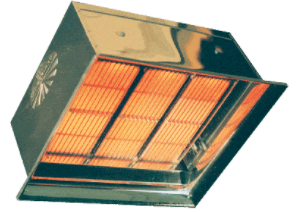 DRP PT Series portable heaters are highly efficient and effective in buildings under construction or renovation. It is unvented, and thus, ideal in spot heating applications or in rooms with high air filtration and high ceilings. Why Opt for Infrared Heating Solutions? Infrared heating directly transfers radiant heat of infrared wavelengths from the emission surface to the objects to be heated, be they people, floors, walls, ceilings, or furnishings. This skips heating the intervening air, as with convection heaters, though a small percentage of heat from infrared heating units does transfer by convection. The directness of infrared radiant heating means that people and objects in a room are warmed more quickly than by other methods. In the case of DRP high-intensity infrared heaters, gas-fired combustion temperatures reach 1800ºF and thus deliver medium wave infrared heat, which is much more readily absorbed by common objects/materials in a building than is short wave infrared heat. The ceramic burner maximizes conversion of heat to infrared rays. High-intensity Re-Verber-Ray-Tor rods enable higher temperatures and greater efficiency. DRP is the first manufacturer to efficiently combine two-stage and infrared heating. Availability in both 16,000 and 32,000 BTUs per hour options. Three control systems available, including manual and solid-state ignition. Compact, CSA-certified, modular design that significantly lowers installation costs. Proprietary safety tip over device. Built using only durable, non-corrosive materials, so that little to no maintenance is required. Five-year limited manufacturer's warranty on the ceramic burner. Mounting bracket, LP hose, and regulator all included. ATI selects for its customers in the commercial HVAC industry the best boilers, burners, and portable heaters on the market, and this DRP product has a proven track record of customer satisfaction. We at ATI make high-quality, high-tech, cost-effective products readily available to commercial consumers, be they contractors, distributors, or end users, and offer our clients cost-saving exclusive deals.